These speakers are pretty crazy looking, but apparently they sound quite good due to the acoustic qualities of porcelain-enclosed cork. The raw design is eye-catching but a little busy, although the toaster-esque volume control looks totally awesome. You’re not going to pick them up at your local electronics store, though; they’re being custom made and are likely going to cost at least $400. You can pre-order them starting in September, and pre-preorder at the designer’s site. 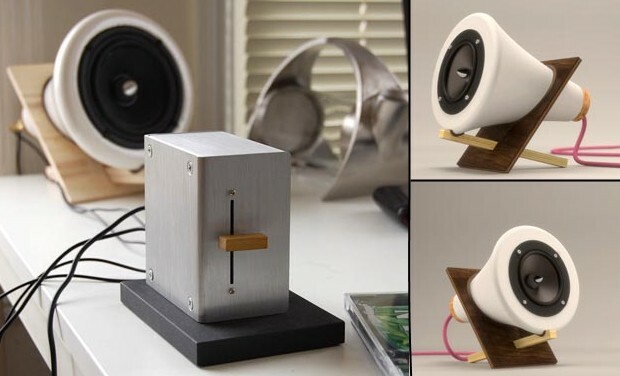 At just 10W per speaker, they’re not going to be filling a room, though for a desk they would be both sufficient and efficient due to their small footprint.